The home of Wing Chun as we like to imagine it. 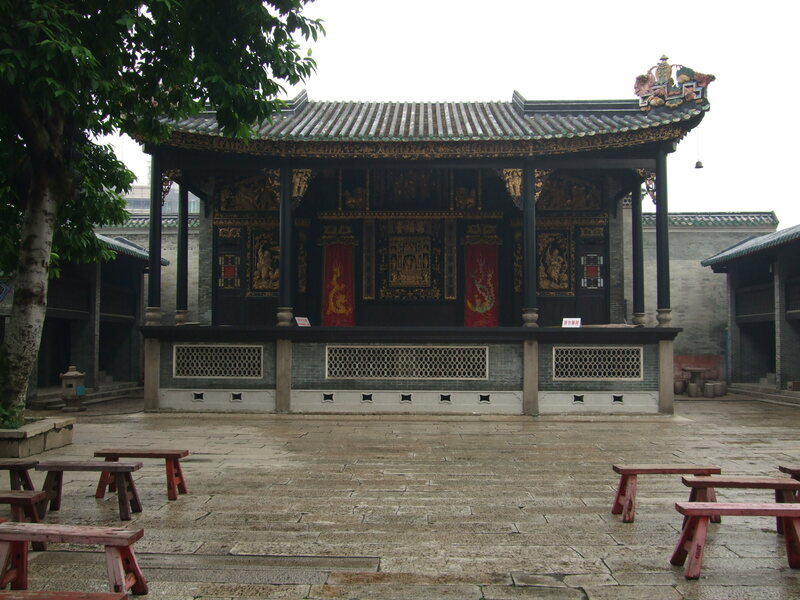 The Cantonese Opera stage on the grounds of Foshan’s Ancestral Temple. Source: Photo by Whitney Clayton, Author’s Personal Collection. In September of 1850 a Major in the Imperial Army stationed in Guangdong took his own life. Records indicate that he was older and struggling with a chronic illness. Given the state of medicine in the middle of the 19th century one can only guess that he was probably in substantial pain when he died. In the grand scheme of things this individual tragedy was of no historical consequence. Yet when I first ran across records of it in the index to the old Guangdong Provencal Archives (seized by the British Navy during the Opium Wars and taken back to London) it had a profound impact on how I thought about the origins of Wing Chun. A Major is an important figure in the provincial military, but they are far from irreplaceable. The archives are full of notices regarding the promotions, retirements, punishments and training of various military officers. Clearly these people came and went, and the replacement of a single Major was basically routine. As such it was fascinating to read how much attention this unfortunate event generated. On September 24th there was a flurry of activity at the Yamen. The first item of business was a report filed by Hsu Kuang-chin (the archive index still uses the Wade-Giles Romanization system so I have kept it here) of the Major’s death. Next a number of other recommendations for promotion were filled to fill the now vacant post. The only thing outwardly odd about these reports was the identity of their author. Hsu Kuang-chin was the Imperial Commissioner of Southern China. One would not normally expect such an important civil official to be taking on questions of human resource management. The reason for such high level involvement would become clear three months later. On December 19th of 1850 Hsu Kung-chin and Yeh Ming-chen (the Provencal Governor, and one of the most important individuals anywhere in the Chinese civil service) filed a joint report to the imperial household following up on the Major’s death. It would seem that in the intervening months they (or their staffs) had been conducting a more detailed investigation into events surrounding the suicide. This was a tense time in southern China. Civil and international battles had already been fought, and more (including the Red Turban Revolt) were expected in the future. The influence of rebel factions and organized crime were growing. Apparently there had been some fear that the Major’s suicide had not been what it seemed. What if he had been compromised? What if he took his own life to prevent himself from being blackmailed or used against his will? With notable relief the report concluded that no outside factors were implicated in these tragic events. The suicide was what it had initially appeared to have been, the death of an old sick man. One can almost imagine the relief in the final report. Yet what do these events tell us about the state of governance in southern China? There was certainly tension, and a number of imminent security threats. Large scale international and civil war were on the horizon and both the Governor and the Imperial Commissioner knew this. Yet this was not an uncontrolled frontier. When you skim over the notes in the archive, it becomes clear that the government and its security apparatus was immensely watchful. Any major crime committed in an urban area was investigated immediately, and even seemingly mundane events, such as the death of an old sick man, could trigger a long and detailed investigation. I find it useful to keep events such as this in mind when thinking about the folklore of the southern Chinese martial arts. Many of these systems tell stories that describe an almost “wild west” situation. We are told of mysterious masters who killed multiple opponents in market-place challenge matches, or wandering Shaolin rebels bent on the assassination of local officials. But how plausible are any of these stories? Not very. Killing someone in a challenge fight was very explicitly against the law. There were no exceptions to this, and no contract could be signed that would actually relieved the other party of responsibility. Such actions would lead inevitably to one’s own arrest and execution for murder. In a few extraordinary cases the sentence might be commuted to years of imprisonment. Kung Fu legends notwithstanding, this was the sort of behavior that the state did not tolerate. Likewise, if the suicide of a single military officer who suffered from a known chronic illness could touch off a three month counter-intelligence investigation led by the two highest ranking Imperial figures in the province, is it realistic to assume that there were packs of Shaolin trained revolutions prowling around the capital, carrying out assassinations, and no one noticed? Cantonese Opera Performers in San Francisco, circa 1900. Chinese Opera and Popular entertainment has been linked to the martial arts since at least the Song dynasty. Even in the Han dynasty military performances were a central part of the “Hundred Events.” Source: This is the author’s personal copy of a photograph that is now in the public domain. The standard Foshan/Hong Kong Wing Chun lineage states that the teachings of both Ng Moy (via Yim Wing Chun) and Jee Shim ended up being transferred to (and united by) members of the “Red Boat Opera Companies” in Foshan. These individual made a living by traveling from temple to temple, performing Cantonese language operas during village holidays. These performances often required great martial skill. Then as now Kung Fu stories were popular with audiences. Nevertheless, the opera singers themselves were members of a low status caste and were often marginalized and ignored by the more powerful members of society (at least when they were not on stage). Of course there is one big problem with all of this. There is a total lack of evidence to support any of it. There is no concrete evidence that anyone did Wing Chun prior to Leung Jan, and while he said that he studied with a couple of retired opera performer (during the ban following the Red Turban Revolt) he did not give us a detailed accounting of their prior activities or political involvements. In fact, all of the more detailed accounts of the lives of the opera singers that we now have come from individuals who were active during the Republic era (1920s-1940s), at the earliest. Other accounts date from the 1950s or even the 1990s. This actually makes a lot of sense. Other important elements of the Wing Chun mythos (such as the character Ng Moy) either emerged or underwent significant transformation in the Republic period. The chaotic word of political intrigue and street assassinations which the opera rebels are said to have participated in actually sounds much more like the 1930s than it does the relatively stable late 19th century (say 1870-1890). Of course Wing Chun was never actually taught as a public art until the Republic era. Almost by definition this is when most of the discussions of its origins and history would have been produced and packaged for public consumption. Nor would this be the first time that we have discovered that some landmark of southern China’s martial arts culture may be more of a product of literary innovation than history. There is a growing consensus among scholars that the Southern Shaolin Temple itself never existed, at least in the form that most Kung Fu legends claim. The entire theme of the Red Boat Rebels is actually something of an appendix to the larger Shaolin myth complex. If there really had been packs of killer theatrical agents plying the waters of southern China, fomenting local revolts and assassinating Imperial officials, the government would have taken notice. The proper reports would have been filed followed by extensive investigations and more reports. That is simply the reality of how the Imperial government worked. The fact that there is no mention of a campaign to foment revolution or conduct political killings in southern China during the relevant decades is pretty strong evidence that 1) such a thing never happened or 2) the Opera Rebels were stunningly ineffective. While silence in the historical record can never really rule out any hypothesis, the first alternative seems to be the much more likely scenario. Of course I do not mean to imply that martial artists were never involved with political violence. They certainly were. That is one of the reasons why I find their history to be so interesting. And there were rebellions and targeted political killings throughout the 19th century. But historians have a pretty good grasp on the forces behind most of these (the Taiping Rebellion, the Eight Trigram Rebellion, the Boxer Uprising) and their narratives have little in common with the myth of the Red Boat Rebels. 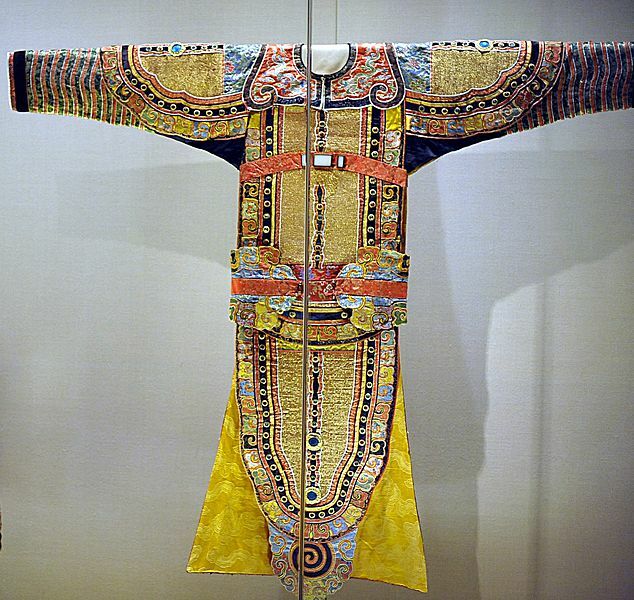 Late Qing era silk opera costume. Elaborate costumes were a stable of Cantonese Opera. Source: Wikimedia. Violence and Radical Politics in the Cantonese Opera Community, 1850-1911. In most cases I would be content to treat such accounts as examples of “local folklore” and move on. Yet in this instance some caution is in required. 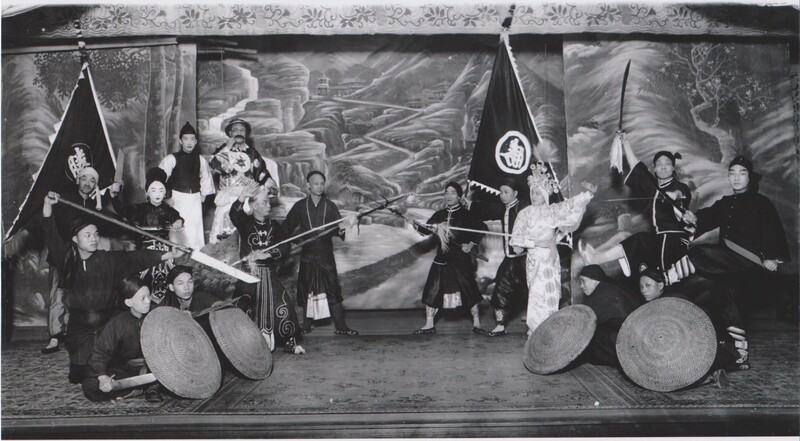 To begin with, the plays staged by various Cantonese Opera troops often focused on heroic feats that required their actors to be highly skilled martial artists. Opera troops actually competed with one another to be the first to demonstrate a new style, or to stage the most spectacular battles. As such they really were an important source of innovation in the southern Chinese martial arts. While the mythology of Red Boat Rebels may be highly historically implausible, the earlier (and less embroidered) account of Leung Jan studying Wing Chun with two retired performers in the wake of the Red Turban Revolt is actually pretty plausible. We may not be able to confirm the existence or life histories of Leung Yee Tai or Wong Wah Bo to the same degree as Leung Jan, but there is nothing about their involvement with the martial arts that challenges credulity. While a little shadowy, it is entirely possible that such individuals did have something to do with the development of Wing Chun and, truth be told, quite a few other southern martial arts. It is also hard to simply dismiss the tradition of the Red Boat Rebels out of hand. Opera companies in the Pearl River Delta did occasionally involve themselves in local political controversies. Some of these events even assumed a stridently anti-government and violent character. While these actions never actually took the form of anything described in the Wing Chun legends, it is pretty clear that later story tellers and “historians” had a lot of good material to work with. I propose that our current tradition linking Cantonese Opera singers to both the creation of Wing Chun and to the prosecution of a violent anti-Qing revolutionary campaign came about through the fusion of two separate half-remembered historical episodes. These were brought together by later storytellers during the middle of the 20th century. The older of these two traditions focused on the role of the Cantonese Opera companies in the siege of Guangzhou and conquest of Foshan during the Red Turban Revolt in 1854-1855. I suspect that many of my readers will be at least somewhat familiar with these events. They have been mentioned in the Wing Chun literature for years, though they are rarely treated in the depth that they deserve. The best historical discussion of the Red Turban Revolt available can still be found in Frederic Wakeman’s classic text, Strangers at the Gate: Social Disorder in South China, 1839-1861 (California University Press, 1966). It would not be hard to write a book on these events, but they are usually overshadowed by the larger, more destructive, Taiping Rebellion which was happening further to the north at the same time. At some point I hope to do a series of posts focusing on the Red Turban Revolt, but I have yet to find the time get started on that project. It is often assumed that the uprising in Guangdong was simply the local expression of the larger Taiping Rebellion which was gripping much of central China. That is certainly what local officials in Guangzhou argued as they sent reports back to the throne. But as Wakeman and others have demonstrated, this was not the case. The Red Turban Revolt was for the most part an independent uprising that resulted from local mismanagement. It actually started as a simple tax revolt which spiraled badly out of control. One of the dozen or so main leaders of this group was an opera performer named Li Wenmao. He managed to put together a large fighting force that had at its core a number of the region’s many traveling opera societies. Li is remembered for entering the fight in full costume, something that B. J. ter Harr reports in a number of other uprisings in the middle of the 19th century. As Holcombe has already pointed out, the moral and political rhetoric of the theater proved to be an effective means of rallying the masses in more than one late Qing uprising. The image of costumed opera singers fighting the government evidently left a great impression on the local countryside. It also made a real impression on the Governor who promptly banned the performance of public vernacular opera and ordered the rebel opera singers to be arrested and executed. The survival of the local government seemed in doubt in 1854. Yet following their eventual victory the political and economic elite of the province unleashed a white terror that saw the execution of nearly one million rebels, secret society members, bandits and opera singers. It took decades for the Cantonese Opera community to recover from Li Wenmao’s disastrous and ill planned revolt. Still, these events help to frame some of the fact that we do know. Leung Yee Tai and Wong Wah Bo were living with Leung Jan and teaching him martial arts precisely because Cantonese Opera performances were illegal and it was dangerous for former performers to be out and about. The very fact that they survived the revolt (and did not follow the retreating opera army to their new “Taiping kingdom” in the north) would also seem to be pretty strong circumstantial evidence that they had never really been swept up in the violence (the repeated assertions of modern folklore not withstanding). Still, the Cantonese Opera community demonstrated that they were quite dangerous as a group and capable of impressive levels of violence. In retrospect these individuals have been remembered with something like awe. Yet at the time they were probably best remembered for the immense destruction and loss of life that they helped to foment. One of the most important things about the Red Turban Revolt that modern Wing Chun students usually overlook is its spontaneous and almost apolitical nature. In retrospect it is easy to see this event on the horizon. The government’s revenue collection tactics (Guangdong’s taxes were the only funds available to finance the Qing’s war with the Taipings) along with other sociological forces had turned southern China into a veritable powder keg. Still, it was impossible to know when the explosion would occur or the form that it would take. Unsurprisingly mounting taxes turned out to be the spark that ignited the bomb. The violence started by pitting secret society members involved in the gambling trade against the government. It quickly spread through a series of bloody reprisals and counter-strikes to include more or less every secret society chapter and bandit group in the country. These groups coalesced into loose armies intent of sacking various towns and cities, and in the process they recruited tens of thousands of desperate peasant “soldiers” who were looking for economic relief and a change in management. Kim (“The Heaven and Earth Society and the Red Turban Rebellion in Late Qing China.” Journal of Humanities & Social Sciences. Vol. 3, Issue 1. 2009) provides a good overview of the various major “chiefs” of the movement. However the one thing that really stands out about the revolt is their relative lack of coordination, or even a common purpose. Some elements of the rebellion were driven by a familiar brand of peasant utopianism, while others seem to have been in it mainly for the money. While the secret society chant “Oppose the Qing, Restore the Ming” was heard throughout the uprising, no one appears to have had any plan for actually fulfilling the second half of the couplet. While we see Cantonese Opera performers resorting to violence and lashing out against the government in the Red Turban Revolt, they are not the politically motivated, highly dedicated, undercover organization described in the Wing Chun creation story. This was an outbreak of community violence more in the mold of Robin Hood than James Bond. This would not be the last time that the Pearl River Delta would see opera performers taking an interest in radical politics and the promotion of revolution. Opera companies were commercial undertakings and they succeeded by telling the sorts of stories that people were willing to pay to hear. Most of these scripts focused either on martial heroics or love stories with happy endings. For reasons that I cannot fathom popular sentiment seems to have demanded that love stories in novels end in tragedy but those on the stage must resolve into a haze of bliss. Nevertheless, opera companies would occasionally find some success by running a politically motivated play that tapped into an important public conversation. The anti-opium and anti-gambling crusades of the late 19th and early 20th century found expression in new Cantonese plays that went on to enjoy some popularity. In the last decade of the Qing dynasty a group of young revolutionaries and students took note of this phenomenon and decided to use it to their advantage. With the backing of the Tongmenhui, Sun Yat Sen’s revolutionary group, about two dozen new “political” opera companies were formed to spread the gospel of nationalism and revolution throughout southern China. Historians from both the nationalist and communist parties have tended to valorize the efforts and success of these groups. They certainly did help to raise the consciousness of the masses in southern China. While very few of their techniques were totally unique they did help to popularize certain innovations, such as singing librettos in modern vernacular Cantonese and they experimented with the staging of western style spoken plays. The best short discussion of this movement can be found in Virgil K. Y. Ho’s volume Understanding Canton: Rethinking Popular Culture in the Republican Period (Oxford University Press, 2006). Like other sorts of opera companies these “revolutionary troops” traveled from place to place. Often this happened in Red Boats. While traditionally associated with Cantonese Opera in the popular imagination, the iconic Red Boats were actually something of a late innovation. B. E. Ward (“Red Boats of the Canton Delta: A Chapter in the Historical Sociology of the Chinese Opera.” Proceedings of the International Conference on Sinology. Academia Sinica: Taipei, 1981.) notes that the first reports of specially constructed Red Boats do not occur until the 1850s. Given the decades long prohibition of Cantonese Opera in the middle of the 1850s, they cannot have become common until the more peaceful late 19th century. Ho indicates that the boats actually reached the peak of their popularity in the 1920s, and then rapidly declined in the middle of the 20th century. On those grounds alone it is clear that the strong association between Wing Chun and the Red Boat Opera singers is more likely a product of the 1920s-1930s than the 1820s-1830s as it does not appear that this symbolic complex would have meant anything to individuals from the earlier period. The revolutionary opera companies of the early 20th century were a very short lived, if memorable, phenomenon. Most of these companies seem to have appeared around 1905, and few survived much past the actual 1911 revolution. Going to the opera was a popular form of diversion, and audiences (quite reasonably) expected to be entertained in the fashion to which they were accustomed. This meant loud music, vulgar lyrics, predictable plots and impressive costumes. What they did not want was to pay good money to listen a political lecture. The revolutionary troupes had another problem. The Cantonese Opera Guild in Guangzhou refused to accept them as members. This appears to have mostly been a reflection of their chronic inability to attract large audiences or sell tickets. As a result they were actually prohibited from playing on any stage associated with the Opera guild. Of course this included most of the venues that could raise a decent crowd. Lastly, while these individuals were “revolutionary” in their politics and ideological orientation (many of the companies explicitly backed Sun Yat Sen) they were much more conservative in their methods. These troops were dedicated to the pen rather than the sword. They sought to spread the revolution by educating peasants, not by assassinating local officials. They were drawn to the stage because of its propaganda value, not its association with costumes, disguises, gangsters or ducking out of town under the cover of darkness. Again, this is not to say that secret societies were never involved in the revolutionary project. After all, Sun Yat Sen’s Tongmenghui itself was a secret society. Nor do I want to imply that political killings never happened. The late Qing and early Republic eras saw an uptick in assassinations and political murders. But once again, these attacks were carried out by terrorist, mercenaries and government agents using very modern guns and bombs. Revolutionary opera companies were not either side’s weapon of choice. 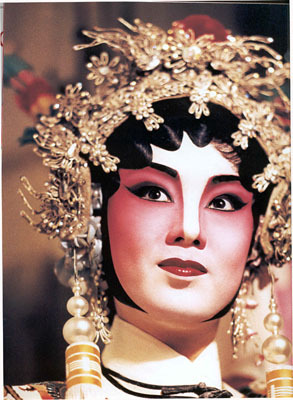 Image of a female general in cantonese opera.Copy Right Granted from Stacey Fong, author of Bay Area Cantonese Opera. Source: Wikimedia. The Red Boat Revolutionaries: Creating a Legend. A very interesting picture has emerged from the preceding conversation. There are at least two periods in the late Qing and early Republic era when factions within the Cantonese Opera community became very visibly involved in radical politics. Both of these eras were short, but highly visible. In fact, they were exactly the sort of thing that was likely to imprint itself on the popular imagination. The first of these occurred in 1854-1855 when Li Wenman led a large number of companies into an open uprising against the government in the midst of the Red Turban Revolt. Far from being covert, most of this violence occurred on the battlefield. The political motivations of the major leaders of the uprising were far from unified. One group escaped the government’s victory in Guangdong to establish their own Taiping Kingdom in the north. Other factions, including many of the bandit and secret society chiefs, appear to have been motivated mostly by the promise of spoils. The tens of thousands of peasant recruits that filled out the various armies were motivated mostly by hunger and desperation. While highly destructive and dedicated to the overthrow of the local government, the Red Turban Revolt was in some respects surprisingly apolitical, especially in comparison to the ongoing Taiping Rebellion in central and northern China. If you skip forward 50 years another group of radical opera singers appears. These individuals are dedicated political revolutionaries. They are ideologically and politically sophisticated, and they seek to spread this radical agenda to the many small theaters and stages that they visit. Like everyone one else along the Pearl River Delta they journeyed by boat, often in the Red Boats that signaled the arrival of a traveling opera companies. While never very commercially successful they made their presence known throughout southern China, and then they disappeared almost as rapidly as they had emerged. We now have all of the pieces to begin to build a new theory of origins of Red Boats Revolutionaries in the Wing Chun creation myth. I should point out that this is just a theory and one that probably needs additional refinement and revision. Given the nature of the discussion I can only marshal circumstantial evidence in its favor, but it may be an idea worth considering. As Wing Chun started to gain popularity in the late 1920s and 1930s it became necessary to repackage discussions of the art’s history and origins in ways that were compatible with the basic pattern of the Hung Mun schools (all of which claimed an origin from Shaolin) and the expectations of potential students (who wanted a story to tell them what this new art was all about). Story tellers in the 1930s and 1940s (individuals like Ng Chung So) would have been alive during the final years of the Qing dynasty and may have remembered the revolutionary opera companies on their Red Boats, spreading radical ideology in their wake. Most of their students, however, would have been too young to have any firsthand knowledge of these events. In an attempt to bring the story of Leung Yee Tai and Wong Wah Bo into conformation with the highly popular Shaolin ethos, the distant memory of the violent 1854 uprising may have been conflated with the more recent revolutionary opera companies to create the vision of a group that sought to use violent means to overthrow the government while “staying undercover” in their daily lives. Stories of such groups, often with reference to various secret societies, were rife in southern Chinese folklore and were particularly common in the martial arts tales of the “rivers and lakes.” In fact, given the fading memories of these two sets of radical opera performers, it seems rather natural that they would fall into this commonly available archetypal pattern. Adopting this new synthesis would also have the added benefit of giving both Wong Wah Bo and Leung Yee Tai (and hence modern Wing Chun) some real revolutionary credibility. This could only be helpful given how popular “revolutionary” rhetoric was in the 1930s. It might also have helped to provide Wing Chun with some rhetorical cover since anyone who examined the art would immediately discover that it was dominated not by the working class (like most other systems) but by wealthy property owners and conservative right-wing political factions. 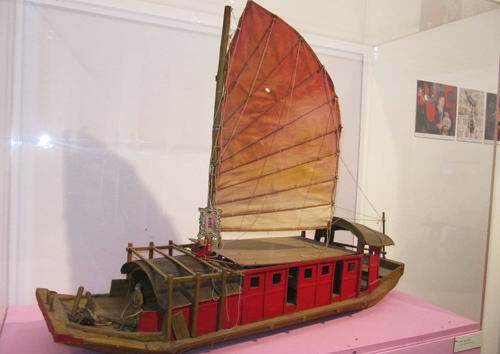 A model of a Red Boat of the type that carried Cantonese Opera companies in the late 19th and early 20th century. The provincial archives of southern China contain no evidence that would point to a campaign of targeted political killings and other subversive activities by revolutionary Cantonese opera companies because such groups did not exist. Most opera companies were more concerned with eeking out a living, and those that may have been associated with secret societies appear to have been smarter than to go around murdering local leaders. This does not mean that these groups ignored politics. In fact, there were two very notable periods when they became involved in the political process. The current myth of the Red Boat Rebels is a mid 20th century conflation of these two memories into a single event. This new construction allowed Wing Chun to connect itself more fully to the revolutionary rhetoric of the southern Chinese martial arts even though the system has a history of reactionary associations and behaviors. It also provides additional evidence that the Republic era (from the 1920s-1940s) was a critical formative period in the creation of the modern Wing Chun identity and mythos. Very interesting and extremely well written. 1) Wingchun actually claims some low caste theatrical roots. That is actually a rare claim for a marital arts lineage, not because those real origins are rare, but because HongKong had different political fortunes than the rest of the country. It is as if, for a moment in history, they were doing the exact opposite of everyone else. Choilifut is obviously closer to opera for instance, but they claim origins from the green grass monk. 2) I’m not familiar with the work you are citing about Red Junks only existing as a convention for a short period of time, but would you conflate that with the notion that Opera companies weren’t traveling by boat in the 17 hundreds? It seems like a meaningless and baseless claim for our purposes. 3) If you read British accounts of the Opium wars, you will see that they are absolutely shocked by the failure of local officials to send accurate reports to the capital. By British accounts, had the Chinese central government had even an inkling what was actually happening in those battles the British would have been easily defeated. In what contexts and on what basis do you consider these particular officials to be open, honest, thorough and direct needs to be explained. Thanks for dropping by. Let me respond to your three points in no particular order. -No, I would not. There wasn’t even much of a road system in the Pearl River Delta in the Qing dynasty, so there was a good chance that anyone going anywhere was on a boat. Whether or not they were these very special Red Boats is an interesting question when it comes to dating specific instances of folklore. But everyone from merchants to poets in the region seemed to spend a lot of time on boats. It was just the easiest way to get between many places. I did not mean to imply otherwise in my post. -My judgements as to the honesty and competency of these particular officials follows the historical literature. Specifically, J. Y. Wong wrote a very detailed biography of Governor Yeh (Yeh Ming-ch’en: Viceroy of Liang Kuang (1852-8). Cambridge University Press. 1976.) which makes extensive use of the existing western and Chinese language sources and does a good job of placing him the larger political and social context. I also rely extensively on the judgments of Fredrick Wakeman (who I cite in the post). Its not that these individuals were not human. Yes, the reports about the “San Yuan Li Incident” that were passed up the chain of commands were deeply flawed, and relied to heavily on self-serving field reports that were never properly investigated. This only served to reinforce popular “groupthink” on the weakness of foreign powers in Beijing. But as both J. Y. Wong and Wakeman indicate, this is not the entire story. Yeh in particular was an extremely talented and driven administrator. The records from his office still exist today and can be read by anyone. In fact, his is the only Yamen library that still exists from all of China so we actually know an extraordinary amount about exactly what sort of leader he was. It is not an exaggeration to say that his actions in the 1850s actually saved the Qing dynasty from collapse. I agree, its very interesting. I think that putting Wing Chun and CLF together is illuminating as it demonstrates the wide range of places a background in opera can take you. CLF has maintained many of the more theatrical elements in its forms, where as Wing Chun went in a very different direction almost from day 1 (I suspect due to local militia training patterns). But they were both influenced by opera traditions from the very start. Thanks Ben, for the great response. Still, I am troubled. The goal of an authoritarian government immediately after a successful assassination would be a complete lock down on the spread of that fact. The goals of a rebel group would be to spread it as widely as possible with out getting caught by the authorities. Given how widespread the rebels were and how thoroughly they had infiltrated the various forms of governance, it might be wise for an official to not to leave a written record at all. In any event I still consider it an open question. As political theater a false claim of an ancestor assassin sure is an interesting selling point in a violent market place for martial arts organizations. Hi Ben, excellent post yet again. Love your work. If what I read is true (probably isn’t, but oh well), then it’s quite plausible that Leung and/or Wong might have some secret society connections. Leung Jan learns Wing Chun from these guys from the late 1840s until 1855, when the opera ban was established. That would give Leung Jan several years of training in Wing Chun. It’s possible he could’ve occasionally met up with one or two of these individuals (after the opera ban) and learned on a less frequent basis. Even if they didn’t continue to train, let’s say hypothetically that Wong/Leung were actually killed, Leung Jan would’ve still had enough training in Wing Chun. Which leads me to my next point. You mentioned in an earlier article that you believed that Chan Wah Shun’s birthdate to be somewhere in the 1840s, and that the 1833 birthdate was implausible. From what I’ve read, Chan Wah Shun’s birthdate is 1836 (1836-1909). Once again, if that’s true (and once again, probably isn’t), and assuming Chan learns Wing Chun at age 25, that means a starting date of 1861, not 1858. By then Leung Jan would’ve had been training Wing Chun for over 10 years assuming my info is right. Even if Leung Jan had actually started learning Wing Chun in the mid 1850s, that would’ve still meant a training time of roughly 6 years before teaching Chan Wah Shun. This also matches up with Yip Man’s supposed training. Yip Man supposedly started training at the age of 12. He was supposedly a student of Chan Wah Shun (and mostly learning under Ng Chung So) for only 3 years before Chan passed away. Yip Man was born in 1893. Chan Wah Shun (according to my source) passes away at 1909 (at age 73). 1909-3 = 1906, so it matches up (Yip Man could’ve been 12 years old, turning 13 that year). P.S. You said in one of your articles that you were writing a book. When is that book coming out? Also, will it be available in e-book format? Thanks for the questions. Unfortunately its impossible to give a concise paragraph long answer to these sorts of questions. There are a lot of things that have been written and said about the lives, careers and birth dates of each of the major figures in Wing Chun’s history. Basically I have had to look at these sources and make choices as to which accounts I thought were the most plausible and which are the most unlikely. Much of the “data” that these discussions are based on are actually interviews conducted in the 1980s and 1990s with various elders recounting the “history” that is taught in their various lineages. Sometimes the information was first collected and documented even more recently than that. I feel that in general this approach is a great way to learn about the oral folklore of Wing Chun and its place in modern popular culture, but its probably a pretty poor way to get any reliable information about the past, especially prior to 1850. Specifically I worry that a lot of these accounts basically cater to the desire to confirm a cherished view of what the martial past should have been like, rather than conveying any actual data about what was there. Trying to tie Wing Chun very closely to a type of anti-government rebellion in the early 19th century Guangdong that probably didn’t exist (at least not in the form that the current folklore likes to imagine), rather than thinking about its close ties to the new-gentry when it actually emerges in late 19th and early 20th century seems to be symptomatic of this. Every Hung Mun art practiced by the Cantonese community claims exactly the same thing, to be descended from the Shaolin temple and secret societies. If in reality all of these arts have an identical history, than the story of Wing Chun is not very interesting. There is nothing to learn from it. Variations, unexpected findings, are great because they expand our understanding of southern Chinese society as a whole. In the case of Wing Chun we might discover that it was not only unskilled laborers and thugs who practiced Kung Fu, but also more elite (and reactionary) members of society looking for some way to protect the basis of their social power. That then prefigures and help to explain the rise of other important social institutions in the history of southern China, like the Guangzhou Merchant Militia. I think a lot of what we do in the internal discussion of the martial arts is actually a type of apologetics. There is nothing wrong with that. If your main interest is deriving personal or social meaning from the Wing Chun system, than opening a rational space for belief in the folklore of the past may empower your practice, and help you to find new and modern meanings in the system. So pointing out that things could have happened in this very specific way is not bad per se. And in truth there is a lot we don’t know about the martial arts of southern China prior to the 1850s. The emergence of a couple of really solid textual sources (comparable to the “Taiji Classics” or the “Bubishi”) could really shake things up in ways that none of us expect. But if your main desire is to understand the emergence of fairly well documented patterns in Southern Chinese social, economic and political structures, then there is no reason to privilege this particular reading of the past. Rather its probably more productive to read the history of the martial arts in light of the actual documented historical sources that we do have which are commonly accept in the academic literature. So its really a matter of what your goal is. And that is why its significant that this is an “academic blog” rather than a pure martial arts blog. At the end of the day my object of study (dependent variable) must be Southern Chinese popular culture and globalization, not Wing Chun. The martial arts are a lens that helps me to see and understand certain sorts of personal experiences. Thank you for asking about my book manuscript. Its under final review with a good university press right now. They keep telling me that we are about a week away from their final call on the manuscript, but we seem to have been stuck there for a while now. When I know who the publisher will be I will let the blog know. Thanks for the reply. Yes, I agree that many martial artists and ‘researchers’ tend to engage in apologetics. Especially after reading a lot of your blog posts (as well as other martial historians like Hing Chao), I have tried to get out of that habit (though I still fail often). 1) What activities did they engage in that would encourage them to develop/learn practical fighting skills (e.g. self protection against bandits/thieves, physical confrontation with other opera troupes, maybe being hired part time as guards/mercenaries, etc.)? 2) Where would they learn these skills from (e.g. are there former militia/guards/martial artists within the opera troupes who can teach these skills, would their travels across different parts of Guangdong expose them to different fighting styles, did they have enough funds to hire instructors, etc.)? I’m trying to find this information within the context of the 18th and early 19th century. I would really, really, really, really appreciate it if you could make an article directly addressing this, and could point me to any pdfs/essays/treatises that are available for download online that discusses this. All excellent questions, and things that I am actively researching. I think its pretty clear that opera played an important role in the development and social definition of the martial arts, and its a subject that deserves more attention. I think that it is also quite interesting that Wing Chun is pretty open in embracing those roots, and that you see hints of operatic performance in CLF. So I agree, these are questions that need to be dealt with. I have quick answers to most of your points above, but I am still doing additional research, looking for more and better sources, and trying to construct a coherent narrative that makes sense of the trends in the martial arts, opera and other aspects of popular culture all at the same time. Unfortunately we have a lot more information for the end of the 19th century than the beginning, but that is just the nature of researching popular culture I guess. Very interesting article Kudo’s! I wonder if you have ever looked into Liang Peiyou as possibly being the Leung Boliu mentioned in some of the lineage lines as Yim Wing Chun’s husband. He was a rather powerful ed turban leader in his own right during the period (though widely regarded as a bandit) He controlled Heshan county for a time and his actions split and segregated many of the heaven and earth society lodges (which had previously enrolled Hakka and Punti alike). His biggest focus was in trying to raise an army by pushing the line that they were to get revenge against the Hakka militia’s that had attacked them in conjunction with the Qing Troops.